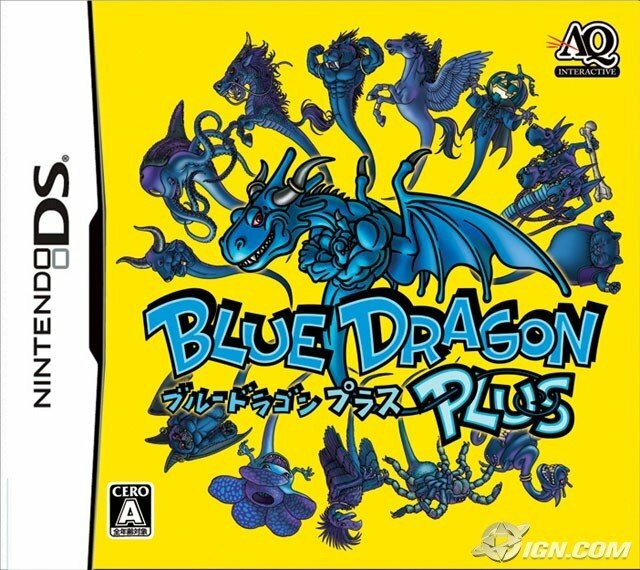 Alright, just finished through the awesome DS game, Blue Dragon Plus. It's been some time since I've played an RPG on the DS and this one was well worth it. Took about 18 hours of game play to go through the main story line and I still have some touch-ups to do with side quests and other aspects of the game. Don't expect the DS to simply wow you with graphics since the machine isn't a PSP but 2-D pixel junkies like me love to see the graphics doing fin in this time in video game history. 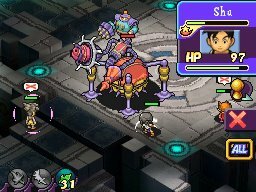 As you can see from the screen shots I kept from my previous posts, the graphics looks much like that of say, Final Fantasy Tactics...which is very accurate to the game play and suitable since the game based off an anime. 3-D graphic are mixed in during real game play when you or your enemies summon their shadows. 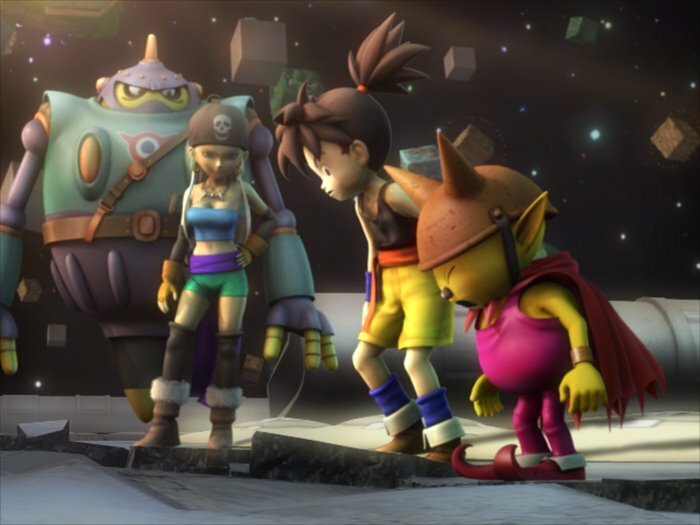 The graphics are done well in the numerous CG cut scenes that litter the beginning and end of the game's story. Granted though, as an anime fan and Akira Toryama fan, I'd rather see hand drawn anime cut scenes (much like Chrono Trigger). Nevertheless, I had no real complaints about the animations here. The instant you hear the music, you know its famed Final Fantasy composer Nobuo Uematsu behind it. Need I say there's much similarity to the music in BDP to that of FFVII's music and that of his earlier FF titles. The battle music might get a bit repetitive but there are a few different scores for the battles throughout your course. Most of the time though, you will have the basic battle theme which will be stuck in your for a while. Not a bad thing but I can tell you I hear it right now a few hours later ^^;. All-in-all a wonderful score and what you'd come to expect from Nobuo Uematsu. Well, the story is set after the end of the anime, I believe. I'll admit, I've only seen the first episode of the anime in which the main character, Shu (looking of course like Goku to some degree) first gains his Shadow powers. If you are a fan of Blue Dragon or plan to watch the series (like me), the game will be a be of a spoiler...but its very well encased in its own, acting like a finale movie to the story. Don't expect any flash-backs, so there will be a story gap for those who haven't seen up to this point. It still is a wonderful story that revolves much around the main antagonist, Nene and his connection to the cube the story takes place in. It took me about 18 hours to go through like I side but it did feel that the main plot goes by very fast. That might not be good for "hard-core" RPG fans but goes well for Blue Dragon and for its platform on the DS. I'm a fan for strategy games like Final Fantasy Tactics and say, Command and Conquer and that's exactly what game feels like, a mix of the two. This of course goes great with the DS's touch screen format. Like FFT, you control a number of characters (up to 16 at once) that each have their own powers and weaknesses. The story splits up the groups into teams but most of the party can switch between these teams. Some area are only playable by certain teams based on the story. 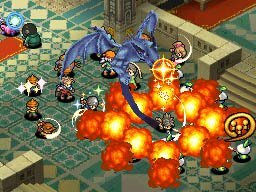 Unlike FFT and more like C&C, Blue Dragon Plus is played in real time. Things of course can get very chaotic and tough at first to command. Eventually as the party grows and with the ability to create Mechas, to join your party, sheer numbers can be used to take your enemies...usually. I've found myself usually keeping my team together in a large group as oppose to spreading them thin. You can practically save at any point which is a big bonus if you are busy like me, once again a testament to the developers keeping with the DS's mobility. The environment of the game is played in the cube and there's no real central hub so to say. Yet there are a few stops like a number of shops, marked by a servant robot at the location. Another great feature is the way you can create your own robot team members. Though not really needed to get through the story, you can create robots from the Activation Units spread throughout the game. You can then customize their abilities based on a rather interesting power-grid circuit format. I wasn't able to get much play-time with this but the more powerful the robots are that you find, the more intricate their circuits are and thus more abilities you can add..that is as long as you don't drain their powers wrong on the grid. Probably will be of good use as I continue doing the side quests the game offers. Overall I really enjoyed the game and after playing it...I really need to sit down and watch the anime (uncut and un-Americanized of course). I give this game a solid 9 out of 10.